Michelle's Pa(i)ge | Fashion Blogger based in New York: A CUE FROM O.P. I took a cue from one of my fashion icons, Olivia Palermo with this outfit. She just so happens to have the same Zara skirt as I do & when I saw her wearing the skirt as a dress, I was amazed at how great it looked. Pulled up as a strapless dress, the skirt has a swing dress feel to it & pairing it with a bright blazer was the perfect pop of color. If you want to try out this trend, grab a maxi skirt & pull it up to your chest the way a strapless dress would fit! Make sure it doesn't have a high slit & top it off with a structured piece, like a blazer, or belt it at the waist to show off your shape. How simple is that? This outfit is so cute on you..what a cool idea! Love this! I would try this in a heartbeat! Maxi skirts are always way too long on me! such a great way to get more wears out of a piece in your closet! Love this! I never wear maxis but this is a cute trend to try.. This is such a cute outfit! Love the flats! I envy the flats. You look amazing!!! You're too cute and I love that idea, too. I braid my hair in the summer as a way to keep it off my face in the heat! Cute outfit! I too love wearing skirts as dresses, I've been doing it for several years now. Cute look. I love the blue blazer. Looks great on you. I added this look to my Fashion Friday Link Up for all my readers to see too! That's awesome! Thanks so much! I'll be sure to take part in your link ups in the future! That dress is super cute! I love the cut of it. me too - just a little bit asymmetric! That is so innovative and looks great!!!! That is a great idea! A bright blazer is really the key to this outfit. I like the belt idea, too. Very inspiring, thanks for sharing! 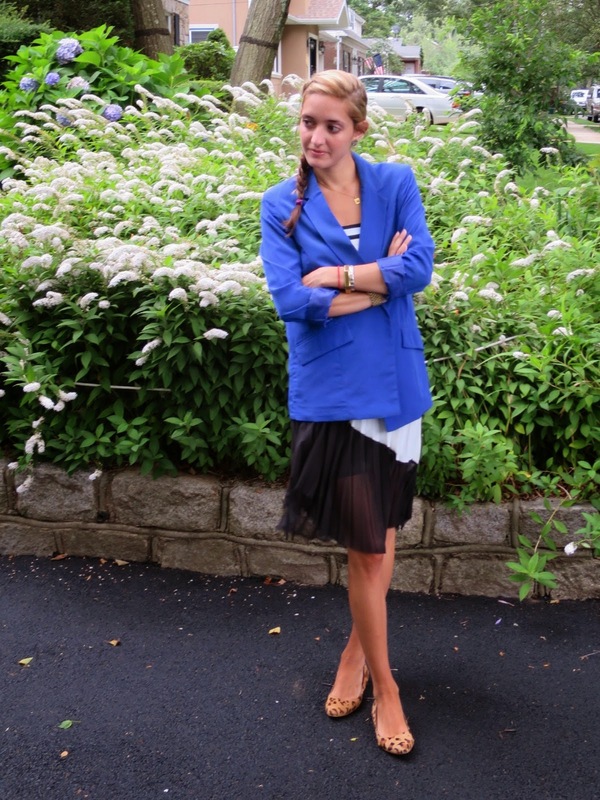 I agree, the blazer adds the perfect pop of color & really turns the outfit into a look!